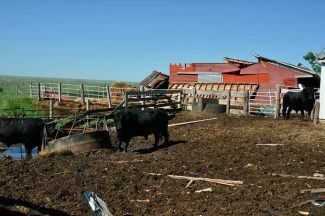 The Deerings lost the 100 year old family barn in a tornado near Hereford, South Dakota Friday, June 19. The cattle they could get to looked fine, but some neighbors had some livestock losses. Photo by Jessica Deering. The wind blows in South Dakota. That's not new. It hails every summer—just ask a car dealer. It even rains sometimes. But it's the quantity of those things that's making life for farmers and ranchers difficult this year. As Mother Nature deals blow after blow, it's important to know what help is available. Most businesses just want you to pay your bill. But insurance agents also want producers to read their policies. Steve Hedstrom, a farm and commercial agent with Western Frontier Insurance in Hettinger, North Dakota, was a farmer/rancher until he was 40 years old. "I hated it when my insurance agent came out. It took so much time. But I realize now she was only trying to help." As an agent now, he strongly encourages his farm and ranch clients to know what's in their policies, before they need to. "You can cover almost everything on a farm and ranch, but it's a matter of picking and choosing what you want covered. Insurance works best when you insure the things you can't afford to lose," he said. "Nobody can afford to insure everything." Hedstrom pointed out some things that are important for producers to know. •	When you insure a building, you are not insuring the contents. Unlike a home, coverage on a shop, machine shed or garage covers just the physical structure. •	No farm/ranch policy will automatically cover livestock. You can get livestock policies, but they are expensive. He recommends getting coverage on the herd, but setting a high deductible, so the premium isn't as expensive and it protects you against a loss you cannot withstand. "Insure against the loss that would be crippling to you," he said. •	There is very limited coverage in any policy for flooding, because the insurance industry doesn't have the financial strength to bear those losses, Hedstrom said. Flood insurance is available from the federal government. If the water damage occurs directly from rain, snow or hail, most homeowner's or farm/ranch policies will cover it, but damage from rising water is generally excluded. •	A "blanket" policy doesn't cover everything you own. There is a list somewhere of the items that policy covers. Review that list annually and make adjustments to the coverages and values. "If it's not listed with your agent or company, even the blanket will not cover it," he said. Items valued at less than $500 do not have to be individually listed, but anything over $500 needs to be itemized in the blanket policy. William Morrison, an agent with Western Dakota Insurors in Rapid City, also emphasizes that producers should make sure they have everything either covered or specifically excluded from a blanket policy. Cattle in particular can skew the value of a blanket policy, which can result in coinsurance penalties if there is any misunderstanding about whether they're covered or not. If cattle are covered, make sure their value is up-to-date, Morrison said. "We can walk you through it if we need to," he said. "It's better to do it before there's a claim than after." Tanner Handcock, owner and agent at Crew Agency in Philip, South Dakota, said they have been getting some crop insurance claims from the hail and wind damage from all over western South Dakota, but "It wasn't as bad as I thought it was going to be. "The winter and spring wheat took kind of a beating. I had guys call in on their safflower that got beat up, some oats—there was a lot of wind damage to the crops, which is unfortunate." He said some alfalfa and grassland loss was reported north of Wall, but he expects the alfalfa to come back. Handcock pointed out that the dry weather in March, April and early May stressed out some of the crops, and that, combined with the cool, wet weather, has put haying season behind. "I don't know if I've seen anyone even starting. Hopefully next week guys will start going in the hayfield. A lot of that has just been too wet to get out there." The Pasture, Rangeland and Forage Insurance, which insures against drought, paid producers who insured the interval between January and April. But if they were insuring against a dry May or June, they're out of luck—or not, depending on how you look at it. "Ranchers and farmers who buy the PRF would just as soon never collect a dime because it means we got the moisture," Handcock said. 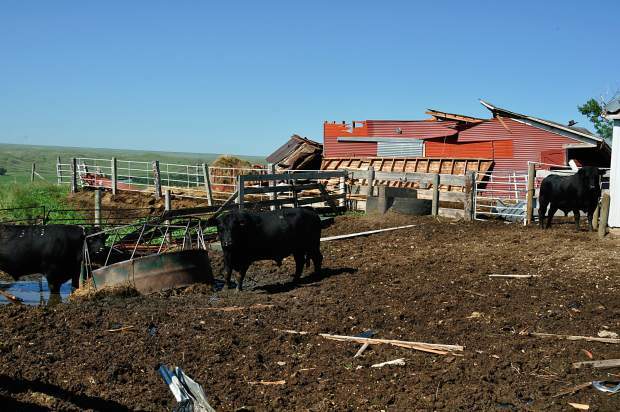 The FSA has several programs to help farmers and ranchers recover from severe weather. Jim Neill, the county executive director for Meade County Farm Service Agency in Sturgis, said they just want producers to know that there is help for them, whether they've lost livestock to hail, fences to flooding or shelterbelts to wind. This program will cost share up to 75 percent for debris removal, repair and restore conservation structures (stock dams, pipelines, watering structures, windbreaks, etc) and fences damaged by flooding or wind. "The phase 'conservation structure' is broader than people think," said Neill. This provides compensation for livestock losses due to adverse weather events (lightning, flood, hail, etc). This is the program that paid producers for losses during the 2013 Atlas blizzard. "These are all standing disaster programs that take effect after the disaster occurs," Neill said. "There are no requirements for emergency declaration, it just had to be an adverse weather event that affects a producer." The FSA office can offer some guidance about what kind of documentation is necessary for each program, and can help producers figure out if they qualify for assistance under any of these programs. Neill asks that producers call the FSA to report damage, whether or not they are planning to apply for assistance. "At least report it so FSA can keep track of the damage. If it exceeds 30 percent of any specific crop, we can ask for an emergency declaration. Even if there's no program that will help you, we're always collecting that data."